Including preprints. Google Scholar version. Mangul S, Martin LS, Langmead B, Sanchez-Galan JE, Toma I, Hormozdiari F, Pevzner P, Eskin E. How bioinformatics and open data can boost basic science in countries and universities with limited resources. Nature Biotechnology. 2019 Mar;37(3):324-326. Baker DN, Langmead B. Dashing: Fast and Accurate Genomic Distances with HyperLogLog. bioRxiv:10.1101/501726. Ling JP, Wilks C, Charles R, Ghosh D, Jiang L, Santiago CP, Pang B, Venkataraman A, Clark BS, Nellore A, Langmead B, Blackshaw S. ASCOT identifies key regulators of neuronal subtype-specific splicing. bioRxiv:10.1101/501882. Langmead B, Wilks C, Antonescu V, Charles R. Scaling read aligners to hundreds of threads on general-purpose processors. Bioinformatics. 2019 Feb 1;35(3):421-432. Pritt J, Chen N, Langmead B. FORGe: prioritizing variants for graph genomes. Genome Biology. 2018 Dec 17;19(1):220. Langmead B, Nellore A. Cloud computing for genomic data analysis and collaboration. Nature Reviews Genetics. 2018 May;19(5):325. Wilks C, Gaddipati P, Nellore A, Langmead B. Snaptron: querying splicing patterns across tens of thousands of RNA-seq samples. Bioinformatics. 2018 Jan 1;34(1):114-116. Describes the Snaptron web service and software (client and server). Nellore A, Collado-Torres L, Jaffe AE, Alquicira-Hernández J, Wilks C, Pritt J, Morton J, Leek JT, Langmead B. Rail-RNA: scalable analysis of RNA-seq splicing and coverage. Bioinformatics. 2017 Dec 15;33(24):4033-4040. Describes the Rail-RNA software tool, as presented at HiTSeq 2016. Langmead B. A tandem simulation framework for predicting mapping quality. Genome Biology. 2017 Aug 10;18(1):152. Collado-Torres L, Nellore A, Kammers K, Ellis SE, Taub MA, Hansen KD, Jaffe AE, Langmead B, Leek JT. Reproducible RNA-seq analysis using recount2. Nature Biotechnology. 2017 Apr 11;35(4):319-321. Describes the recount resource and Bioconductor package. derfinder. Nucleic Acids Research. 2017 Jan 25;45(2):e9. Describes the derfinder differential expression tool. Nellore A, Jaffe AE, Fortin JP, Alquicira-Hernández J, Collado-Torres L, Wang S, Phillips RA, Karbhari N, Hansen KD, Langmead B, Leek JT. Human splicing diversity and the extent of unannotated splice junctions across human RNA-seq samples on the Sequence Read Archive . Genome Biology. 2016, 17:266. Describes the Intropolis resource. Research highlight by Robert & Watson. Wulfridge P, Langmead B, Feinberg AP, Hansen KD. Choice of reference genome can introduce massive bias in bisulfite sequencing data. bioRxiv doi: 10.1101/076844. Darby MM, Leek JT, Langmead B, Yolken RH, Sabunciyan S. Widespread splicing of repetitive element loci into coding regions of gene transcripts. Molecular Genetics. 2016 Nov 15;25(22):4962-4982. Pritt J, Langmead B. Boiler: lossy compression of RNA-seq alignments using coverage vectors. Nucleic Acids Research. 2016 Sep 19;44(16):e133. Describes the Boiler RNA-seq alignment compression tool. Nellore A, Wilks C, Hansen KD, Leek JT, Langmead B. Rail-dbGaP: analyzing dbGaP-protected data in the cloud with Amazon Elastic MapReduce. Bioinformatics. 2016 Aug 15;32(16):2551-3. Describes the Rail-dbGaP software and protocol. The Computational Pan-Genomics Consortium (incl Langmead B). Computational pan-genomics: Status, promises and challenges. Briefing in Bioinformatics. 2016 Oct 21. Reinert K, Langmead B, Weese D, Evers DJ. Alignment of Next-Generation Sequencing Reads. Annual Reviews: Genomics and Human Genetics. 2015;16:133-51. Frazee AC, Jaffe AE, Langmead B, Leek JT. Polyester: simulating RNA-seq datasets with differential transcript expression. Bioinformatics. 2015 Sep 1;31(17):2778-84. Describes the Polyester software tool. Kim D, Langmead B, Salzberg S. HISAT: a fast spliced aligner with low memory requirements. Nature Methods 2015 Apr;12(4):357-60. Describes the HISAT software tool, based on Bowtie 2. Frazee AC, Pertea G, Jaffe AE, Langmead B, Salzberg SL, Leek JT. Ballgown bridges the gap between transcriptome assembly and expression analysis. Nature Biotechnology 2015 Mar;33(3):243-6. Describes the Ballgown software tool. Wilton R, Budavari T, Langmead B, Wheelan S, Salzberg S, Szalay, A. Faster sequence alignment through GPU-accelerated restriction of the seed-and-extend search space. PeerJ 2015 3:e808. Describes the Arioc software tool. Frazee AC, Collado Torres L, Jaffe AE, Langmead B, Leek JT. Measurement, Summary, and Methodological Variation in RNA-sequencing. Statistical Analysis of Next Generation Sequencing Data. Springer International Publishing, 2014. 115-128. Song L, Florea L, Langmead B. Lighter: fast and memory-efficient error correction without counting. Genome Biology,2014 Nov 15;15(11):509. Describes the Lighter software tool. Hansen KD, Sabunciyan S, Langmead B, Nagy N, Curley R, Klein G, Klein E, Salamon D, Feinberg AP. Large-scale hypomethylated blocks associated with Epstein-Barr virus-induced B-cell immortalization. Genome Research. 2014 Feb;24(2):177-84. Schatz MC, Langmead B. The DNA Data Deluge. IEEE Spectrum. July, 2013. Slashdotted. JHU news release and magazine article. Herb BR, Wolschin F, Hansen KD, Aryee MJ, Langmead B, Irizarry R, Amdam GV, Feinberg AP. Reversible switching between epigenetic states in honeybee behavioral subcastes. Nature Neuroscience. 2012 Oct;15(10):1371-3. Gurtowski J, Schatz MC, Langmead B. Genotyping in the cloud with crossbow. Curr Protoc Bioinformatics. 2012 Sep;Chapter 15:Unit15.3. Describes the BSmooth software tool. Describes the Bowtie 2 software tool. Selected for author profile. Frazee A, Langmead B, Leek JT. ReCount: A multi-experiment resource of analysis-ready RNA-seq gene count datasets. BMC Bioinformatics. 2011, 12:449. Langmead B. Aligning Short Sequencing Reads with Bowtie. Curr Protoc Bioinformatics. 2010 Dec;Chapter 11:Unit 11.7. Leek JT, Scharpf RB, Corrada Bravo H, Simcha D, Langmead B, Johnson WE, Geman D, Baggerly K, Irizarry RA. Tackling the widespread and critical impact of batch effects in high-throughput data. Nature Reviews Genetics. 2010 Sep 14. Describes the Myrna software tool. Langmead B. Cloud Computing for Data Analysis: Toward the Plateau of Productivity. Bio IT-World. 2010 August; Vol. 9, No. 4: 36. Schatz MC, Langmead B, Salzberg SL. 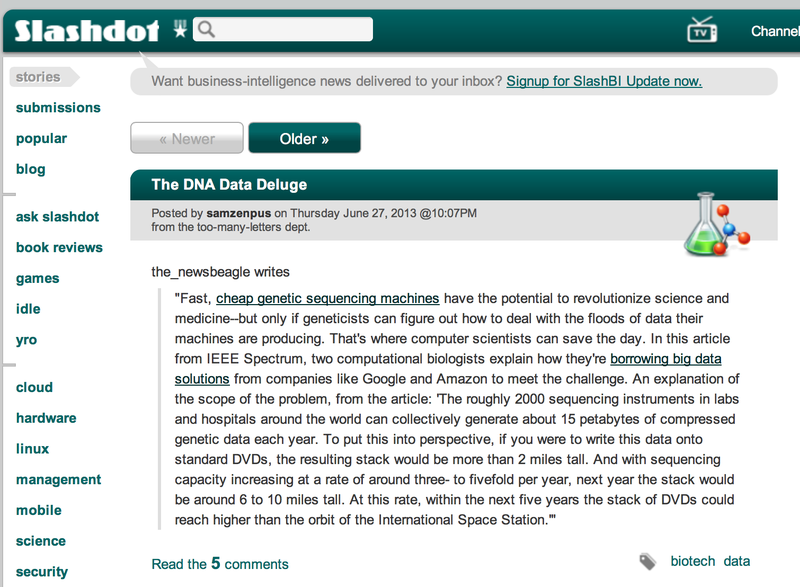 Cloud computing and the DNA data race.Nature Biotechnology. 2010 Jul;28(7):691-3. Langmead B Highly Scalable Short Read Alignment with the Burrows-Wheeler Transform and Cloud Computing 2009; Master’s thesis, University of Maryland. Describes the Crossbow software tool.